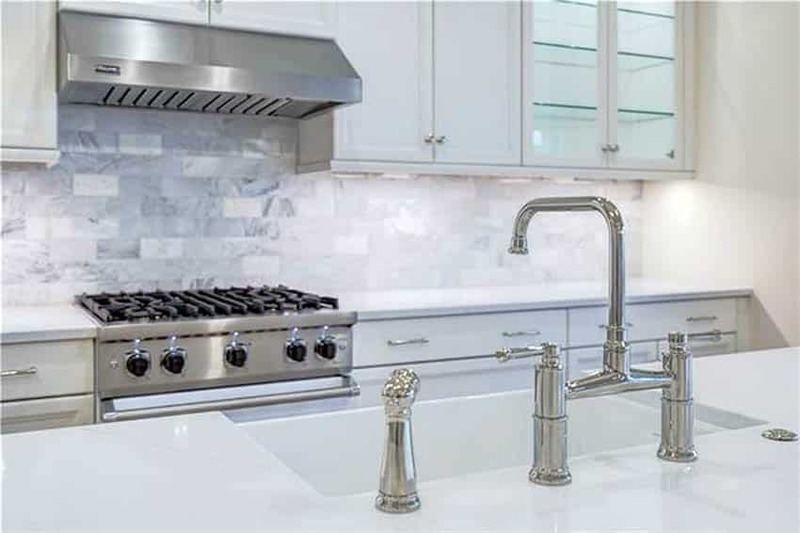 Welcome to our guide on the types of kitchen faucets including, popular finishes, configurations and styles for your home. 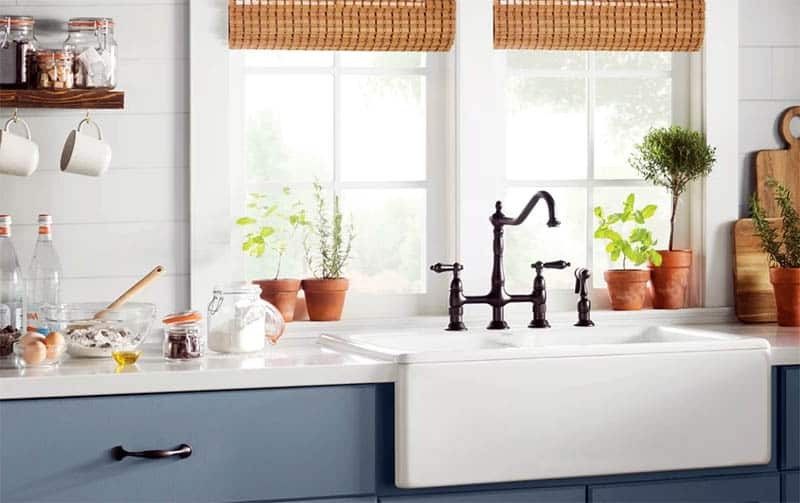 Welcome to your guide to the perfect kitchen faucet! Here you will find different types of faucets, different parts and all the tips and tricks in between. 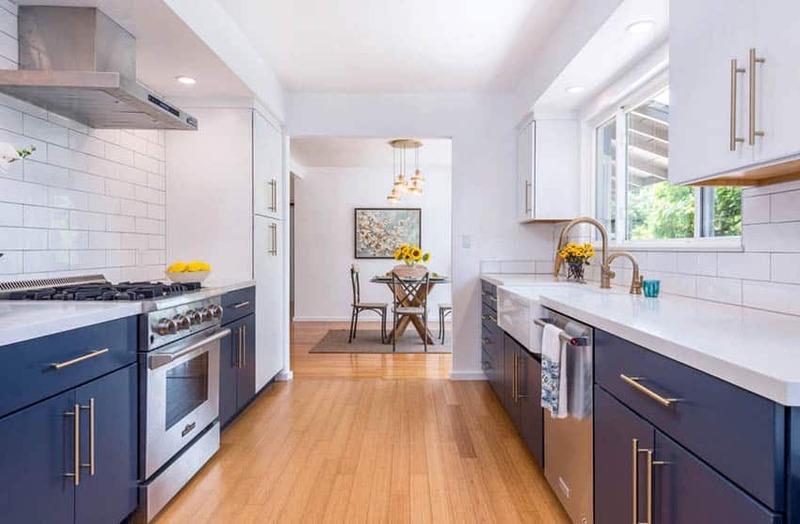 The kitchen is a valuable and well used part of the home and while the faucet may seem like just a small part of that it will actually affect almost everything you do in the kitchen. Washing the table and counters, you’ll need to use the faucet. Making spaghetti, needs the faucet. Plus, the faucet is something that you will want to match your beautifully selected countertops. 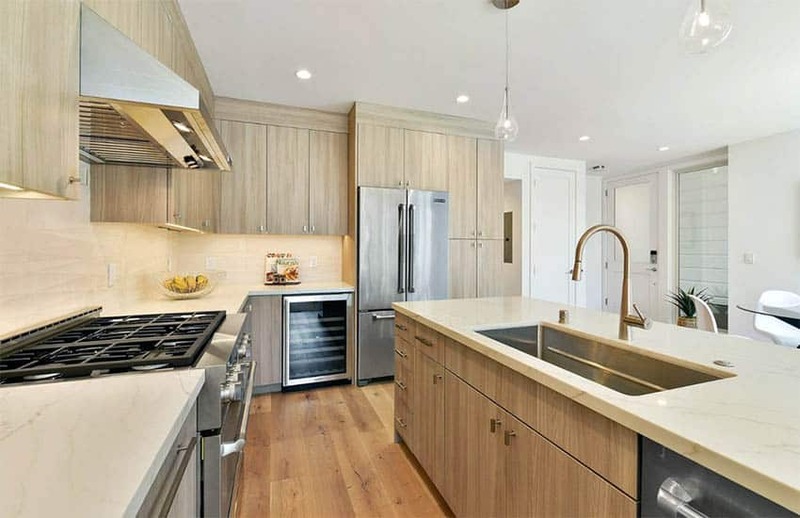 Frequently you can even match your faucet finish with the appliances to make an all around cohesive look. 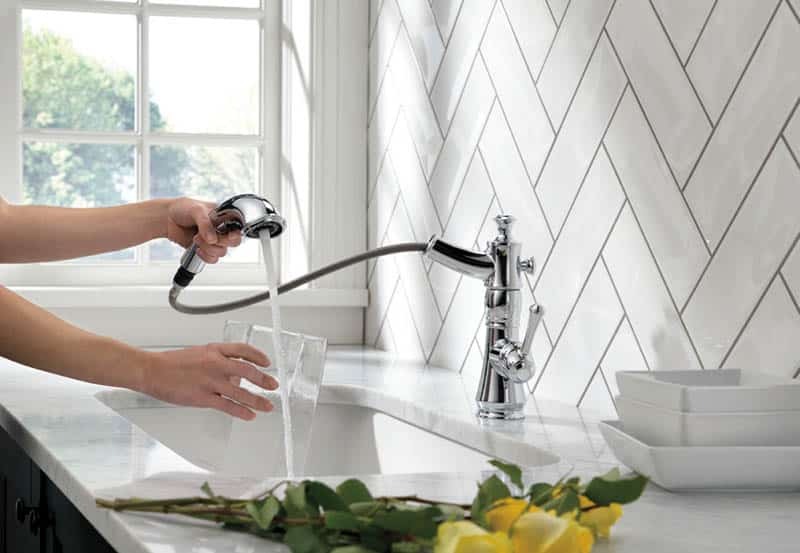 Faucets are going to be one of the most used items in the kitchen, and with so many features, varieties and configurations it is important to select the right one for your particular needs. 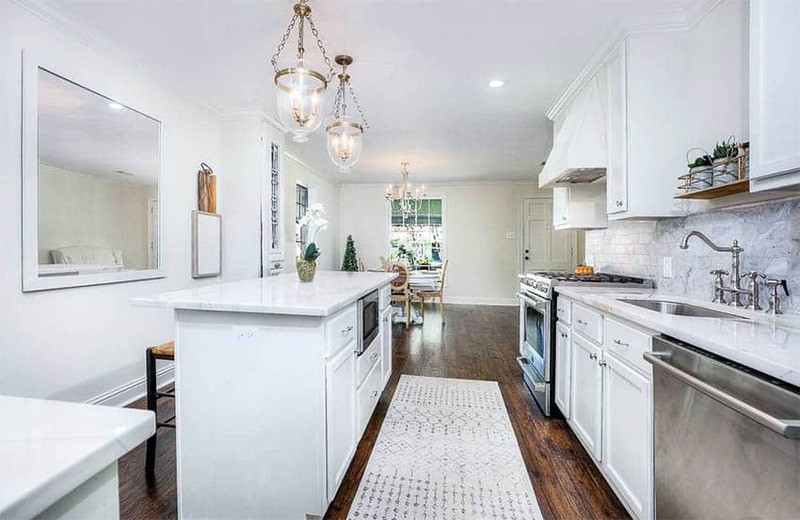 This can include who will be needing to use the sink, what you will need to be cooking in the kitchen, your cleaning habits, how many people you typically cook for, or even just your aesthetic taste. Pull out kitchen faucets have detachable heads that can pull out with a hose or snake. This makes it a very useful tool, no matter what angle may need to be reached. A pull out faucet design also allows you to get closer to the items you are cleaning and direct the flow of water exactly where you want it to go. Pull out faucets have a single hole design and are often equipped with an adjustable sprayer feature. They are quite useful for washing dishes, cleaning the sink or spraying inside pots and pans. 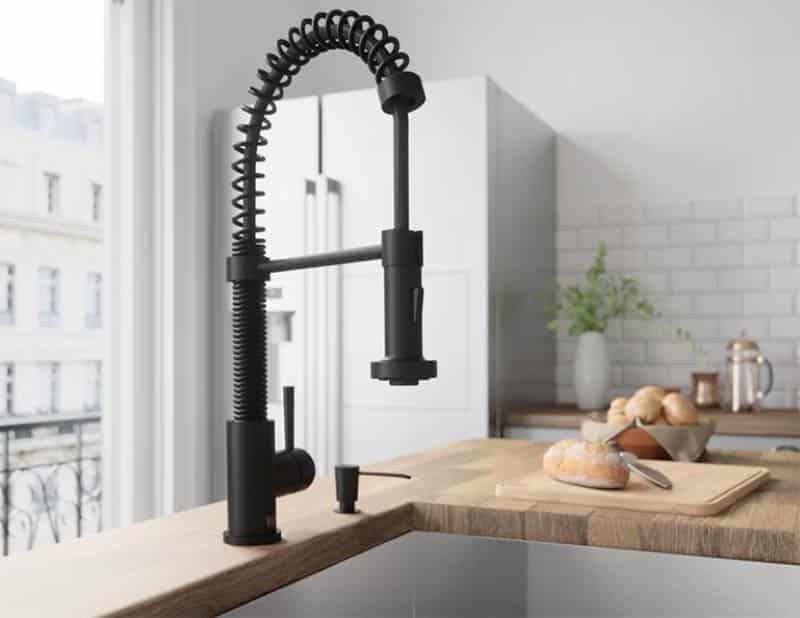 Extremely similar to the previously mentioned pull out kitchen faucet, the pull down will have a movable head. In this case the head will only be able to move (you guessed it!) downwards. This option has less movement as well as a little less splash and risk of mess. As one of the more common and simple types of configurations. You will use one handle to swivel back and forth to determine temperature and up and down for flow power. Many one handle kitchen faucets also have side sprayers, pull down or pull up designs. A two handle kitchen faucet also known as a dual handle, is another basic and common configuration. A two handle designs has a separate handle for hot water and cold water. These can either be placed on the same central piece, or completely separate from the rest of the faucet. This configuration requires separate connections to the hot and cold water similar to bathroom setups. In the setting where you would like regular faucet but would also like the functionality of a pull out faucet, a separate sprayer can be a very viable option. This will be a sprayer that when removed will spray water, causing the typical flow to stop. This is because the handle to the water supply will be linked. The regular flow will work when the sprayer is not engaged. 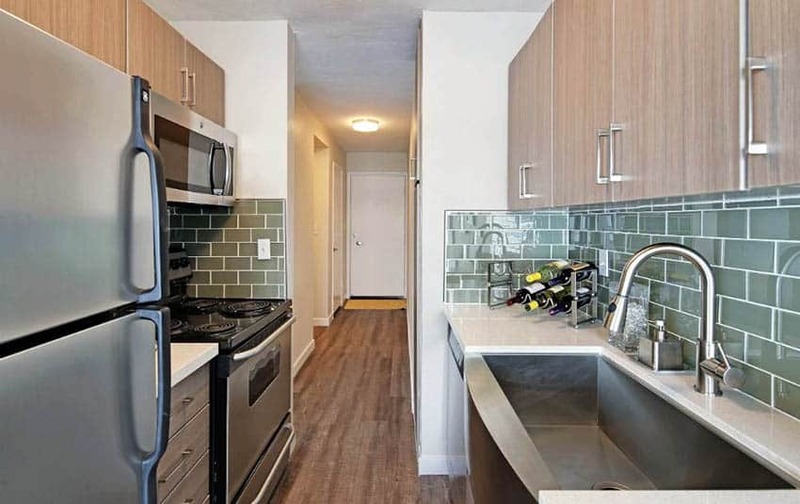 Commercial kitchens will have longer and more flexible sinks because they are used even more than residential ones and for a lot wider a variety of tasks. The base will not have a cover. There are some models that will have multiple taps for multiple streams to complete multiple tasks. 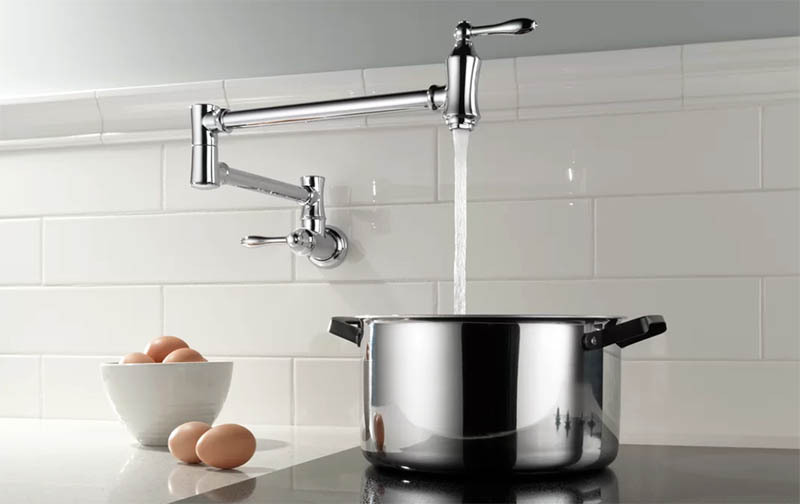 Pot Filler Faucet – Pot filler faucets have a special neck called an articulating neck, this will allow the faucet to swivel in and out to reach pots or large items to fill them up easier. This is frequently used in commercial kitchens, but can also be found in high-end residential kitchens as well. They are generally positioned above the stove top and are quite useful for filling up deep pot and pans. 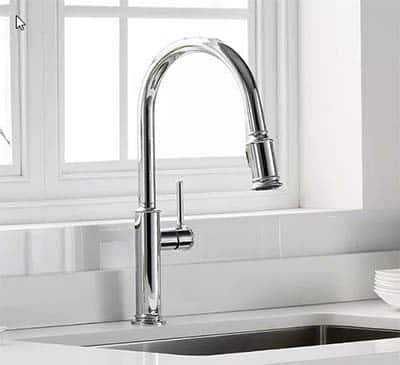 Touchless Kitchen Faucet – also known as a Motion Sensor Kitchen Faucet or Hands Free Kitchen Faucet will allow the user to turn on a faucet without any physical contact. These will have a sensor in the lower area of the faucet, typically where one would place their hands to wash. Pots and pans can also trigger the sensor depending how sensitive a sensor you have. Adjusting the temperature of the water will be done with a handle. Touchless faucets have pros such as preventing the spread of bacteria, convenience and using less water than regular faucets. However, they also have a couple of cons like temperature control, energy cost, and price. Knowing the parts of the faucet will make picking things out and understanding the lingo a little easier. Faucets themselves are actually pretty basic parts compared to some of the plumbing items that are installed. The physical faucet itself is really only made up of three parts, the neck, spout, and handles. The neck of a faucet will be the tube that carries the water from the reservoir to the spout. In certain configurations this will come into different sizes and shapes. There are three main types of necks, which are standard, straight, and goose neck. More information on these are below. The spout of the faucet is the part that releases the water from the neck to the sink. This piece can be removable, in the pull out and pull down configurations and can come in a variety of shapes and sizes. The handle is the part of a faucet that opens and closes the valve allowing the water to pass up through the neck and out the spout. These could be beside the faucet itself or at the bottom of the neck. These are the handles that the primary user will use to turn the faucet on and off. In addition to the physical pieces of the kitchen faucet there will need to be holes for installation. There are multiple different types of installations based on the number of holes a faucet has. 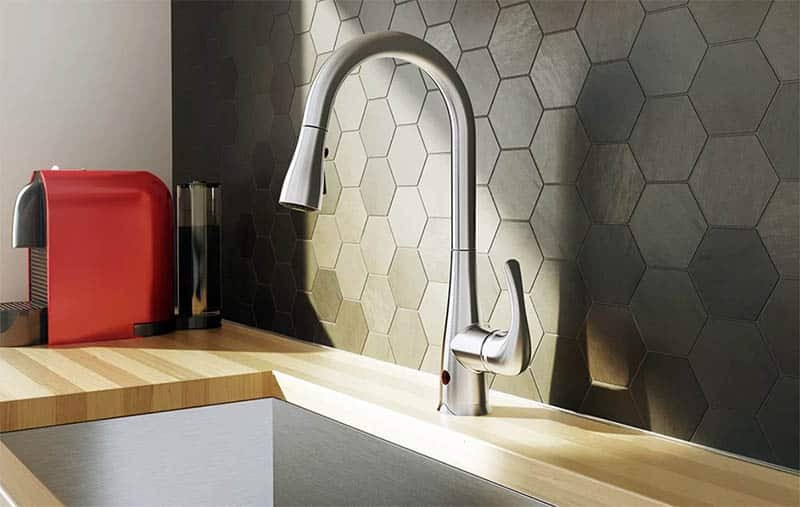 A single hole faucet tends to be more of a contemporary look. A single hole design can have one or two handles but will only have water coming from one pipe. A ‘bridge’ faucet has a double hole design. This design will have two valves that join together to mix the warm and cool water to make the right temperature. A ‘widespread ’or three hole design, is basically the same thing, except the pipe is below the surface. As explained in detail above the neck of the faucet will be the path from the pipes to the spout, this will be the longest, most noticeable part of the faucet. There are a three basic types of necks when it comes to faucets, but there is always room for creativity. Standard – The standard neck will be a lightly curved neck. Easy to fill a pot, fill the sink, or complete other kitchen duties. These come in different sizes and degrees of curves, but they are a typical, basic faucet choice. These will be good tot keep prices down when there are not any style or size constrains on the project. Straight – A straight neck is pretty self explanatory, it is a neck that goes straight out into the sink, this offers a little less space to get a pot underneath but is on of the more cost effective choices. These types of necks are usually used in bathrooms or sinks that are deeper to still be able to be used to its best ability. Goose Neck – A goose neck will have an extremely high arc shape to it. This allows for easier use when filling pots. A goose neck will be a little more expensive than the standard and straight because it will require more material to make it as well as it is a bit more of a decorative piece. These are the main types of neck that are used for kitchens. If you are looking for a new creative neck you could try an articulating neck, which has multiple joints that will help shoot water in many directions. Another choice for décor would be a shepherd’s crook, this is basically a straight neck with an added curve on the front. This adds some extra space when filling things and adds a decorative feature. One Handle – A one handle design of faucet will be able to be operated with only one hand. The handle could be placed on the side or top of the spout or next to the spout if it is a two hole design. This can give quite a bit of options as well as being a little easier to get the exact temperature of water you would like. Two Handle – Also known as a dual handle, is another faucet handle type. Two handle faucets make the water temperature a little more drastic, but is a good symmetrical option for kitchens. This type is most commonly found in bathrooms and will affect which types of configurations and holes you will need to place. Compression Valves – Compression values are a basic washer faucet. These will have separate handles for the cold and the hot water and will be screw-like which will compress the valve against the washer. Though these types of valves are typically the easiest to maintain they tend to wear out the quickest which can cause dripping. Ball Valves – Ball valve faucets are is a washerless faucet. This type in particular includes one handle that moves over a ball shape. Inside there is either a plastic or metal ball that will control the inside. The ball has chambers, slots, rubber o-rings and spring loaded rubber seals that help it perform its function; setting temperature and flow speed of the water. These will be a little more complex than the compression valves. Cartridge Valves – Cartridge valves are also washerless, using a brass and plastic cartridge which has shown to be more reliable. These are not as complex as the ball valve and will be easier to repair, though there are typically not many problems with this type of valve. Ceramic Disc Valve – One of the newer products on the market, ceramic disc valves are high quality, reliable, and rarely needs repairs. These will be single handle faucets. Ceramic disc valves use two highly polished ceramic discs that when in use will slide against each other to control the flow of water. Though ceramic disc valves are one of the most durable and long lasting types, if something does need repair, it is typically pretty expensive due to the complexity of the mechanism. Where to and how to mount a kitchen faucet is something that needs to be considered before installation. Holes will need to be cut to the place and specifications of the faucet as well as the piping needing to be in the right places. This can be the trickiest decision when it comes to repairing, replacing and placing a faucet. Pipes need to be able to connect to parts of the faucet to get the water to flow through. Sometimes contacting a plumber is the best idea. Mounting a faucet from the wall can keep the counter clean and clutter free. The requirements for this type of installation are a bit more extreme, for example, this sort of installation should not be used on exterior wall. This is because the pipes need to extend above the countertop, putting this on an exterior wall can cause the pipes to freeze in colder climates. A deck mounted installation of a kitchen faucet is one of the more simple and common installation methods. This will require enough counter space between the wall and the sink basin. This type of installation will also require hole to be placed in the countertop itself. After deciding which installation will work for your project, check below for faucet installation tips and tricks. Selecting what the faucet is made out of will have a great impact on the length of the life of the faucet as well as the price. Some popular options of materials are brass, stainless steel, plastic, and zinc. This is not to be confused by how the piece will look, this is not the finish, merely what material the faucet is made of. Brass – Brass is one of the most durable and easy to produce materials for a kitchen faucet. Brass can be made into a wide variety of makes, models and finishes allowing the options to be almost limitless. Stainless Steel – Stainless steel is a more expensive option, but will not need an additional finish, occasionally they will apply an extra clear coating as a protective barrier, but they want to keep the beauty of stainless steel. Copper – Copper is typically a darker tone and is best in classic sinks. This will require some maintenance to keep it looking nice and shiny. Plastic and Zinc – Plastic and Zinc are quite a bit less durable than brass, though highly resembling it. 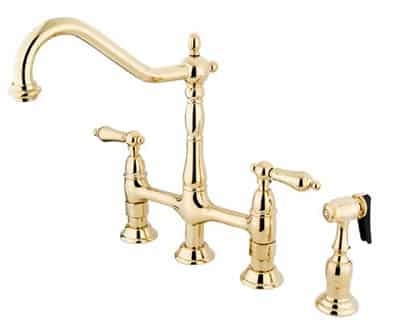 Often in brass faucets they will use pieces of plastic or zinc to offset the weight and price. Plastic and zinc are light in weight and light in price. The finish of a sink faucet is just as important as the configuration or materials because that is what you see day to day. The finish can be applied by electroplating, physical vapor deposition or powder coating. Electroplating is the most common method by being submitted into a tub of dissolved metal that attaches to the faucet. This typically creates a long lasting finish but is more susceptible to harsh cleaning products. The PVD method uses a vacuum instead of a bath to attach the metal ions to the faucet. This method will not need a clear coat but is typically more expensive. Powder coating consists of the faucet being sprayed to create a thick and even layer, but it is not as durable as the previously mentioned methods. After picking a method there is still the fun part of selecting the actual finish, some options are as follows. Stainless steel is one of the more popular finish, avoiding too much shine and in attempt to coordinate with appliances in the kitchen. Stainless steel is goof for most faucets especially contemporary styles and straight squared off faucets. 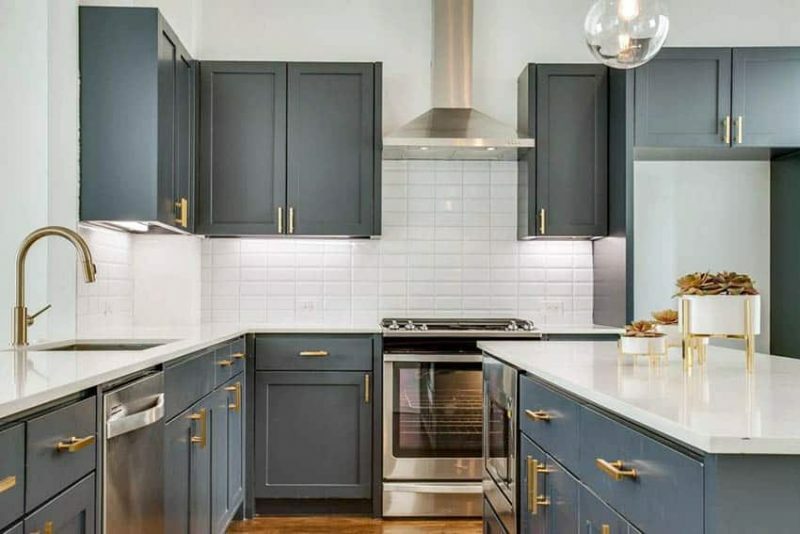 Brushed nickel is an in between from stainless steel and chrome, with only a medium shine but still the gray silver color nickel can fit into both contemporary and traditional spaces. Polished nickel on the other hand is used when a shinier finish is desire. A nickle finish is a good choice as it can match a variety of interior design styles and can appeal to be a different shade of color depending on the lighting used. Chrome is a typical shiny silver looking finish with a slight bluish shine. 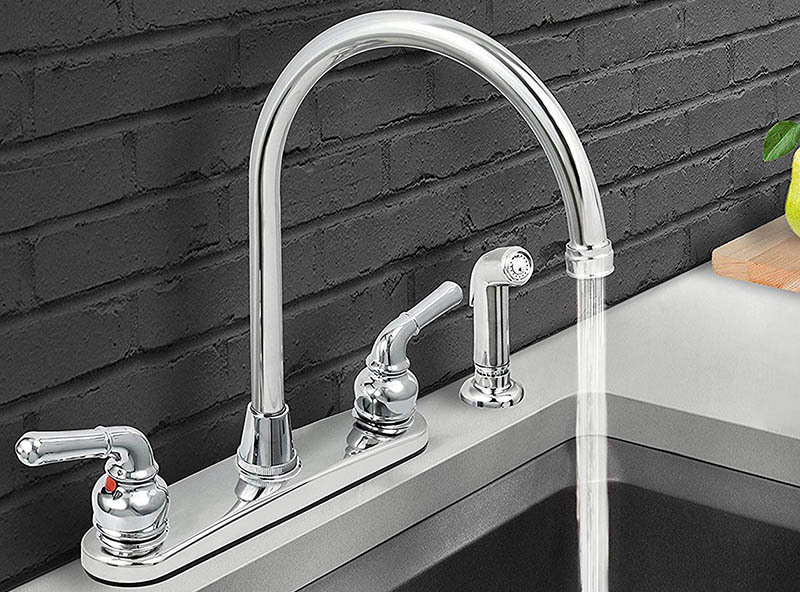 Chrome adds a modern finish to any style of faucet and will bring shine and beauty to an otherwise basic kitchen without overpowering it. As for the amount of sales, chrome is currently the best selling type of faucet finish. Although for remodels and DIY projects the trend is to use a special finish such as oil rubbed bronze or brass to make a statement. Chrome also provides its own protection against tarnishing. However, stainless steel is more durable than chrome overall. To get a brass look all you really need will be a clear coat over the brass material used to make the faucet itself. Or brass can be put over a different material as well. This finish will be a great choice for traditional styles, it adds a rustic look. It can also work well for Mediterranean & Italian kitchen designs. Oil rubbed bronze is easy to clean, and hides spots well. 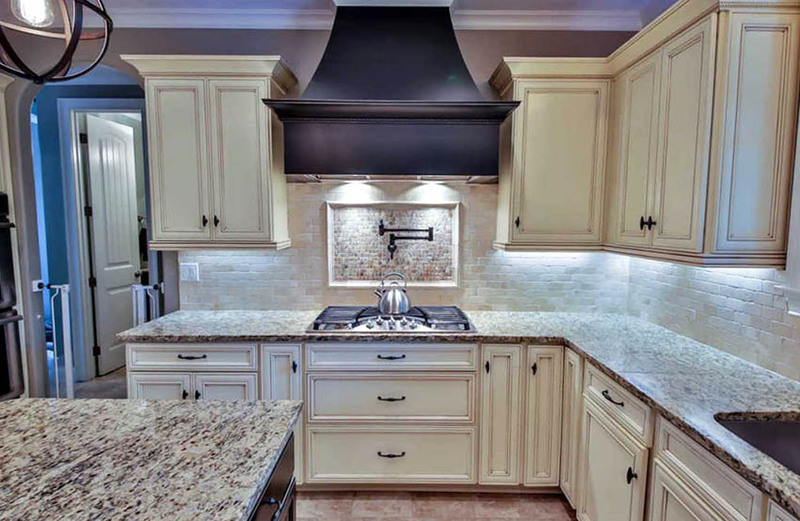 A downside could be the cost which is often priced higher than other comparable types of finishes. With a modern look that resembles wrought iron, black matte can add a dramatic flare to any style kitchen. However, this finish is often used effectively in a modern, contemporary or industrial designs. The black matter will also hide water spots and finger prints on the surface. Another great thing about a matte black model is it can make a big impact in the look of your room with a quick installation. The downside to this is it may be challenging to match all of the other fixtures in the room to get the exact look you want. White is a very modern, but bold choice. This can offset a dark countertop and should get a protective coating or be cleaned regularly to stay in tip top shape. The protective coating is often porcelain, which is easy to clean and hides smudges and water spots well. Porcelain fixtures are more prone to chipping than metal finishes. So those who use a lot of pots and pans in the sink will need to use a little more caution. There are many features to choose from when picking a faucet for your home. Thinking about what you do when in your kitchen and what features you will need will help narrow down the ones to choose from. Often you can pick multiple different features and each one added will tack some extra dollars onto the price tag. An adjustable height, which can help when needing to fill tall pots or washing large objects. As the name suggests it will allow the neck to be movable to adjust it up and down. Water Filtration faucets, which will help make the water flowing out pure. This will allow the water from the faucet to be drinkable, if it is not already, or taste better. Sometimes this can be an added on feature later. An adjustable angle, which allows for different angles at cleaning oddly shaped or sized items. These will be in configurations such as a pot filler or an articulating neck. An adjustable stream, also known as a variable-flow head, which will change how heavy a flow will be. This is useful for those who want more control over their water flow from a trickle to a stream. Swivel spout, allowing for better movement of the spout. Buttons for garbage disposal or water flow. 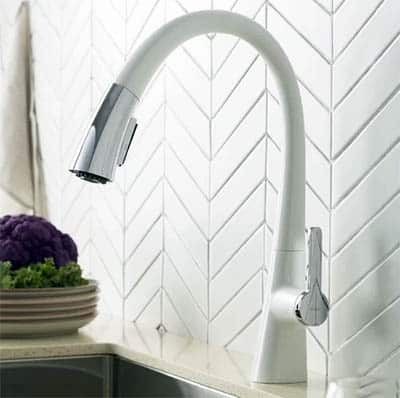 Hands free, also known as motion sensor faucets allow one to turn the faucet on by simply putting your hands in front of the faucet instead of touching it to begin. Touch sensitive, which will allow the user to turn on the faucet with a light touch instead of needing to manually flip a lever. Easy clean surfaces, which are finishes that resist spotting and soiling. These will look nicer between cleanings and even better directly after. High temperature limit stops, which allows you to pick a temperature for the water to never exceed. This helps to avoid burning and scalding. Water conserving, which will reduce the water usage but not the pressure or flow. Aerator Faucet, which will add air to the stream for a more gentle spray and less splashing. Prices for faucets can greatly vary, whether you are willing to spend thousands or under a hundred. In the current times prices are generally falling for faucets which is good news. There are some available in to $20 range, but it is recommended to stick to around the $200 price point to get a high quality model that will last many years of day to day use. In the long run it will benefit you anyways because a cheap manufactured product run the high risk of dripping and leaking, wasting quite a bit of water over time as well as will require more replacements and repairs over time. Prices will be dependent upon the material, design, finish and quality of the faucet. Bronze and copper will cost around $300 to $500, the better materials (stainless steel) go up from there based on the types and features. The size of faucet to get greatly depends on your kitchen. Sink size is important, as well as how much space above the sink is available. If the faucet is the last thing you are installing there will typically be inlets about 8 inches away from each other, meaning the faucet should be 8 inches long. Sometime there is only one hole in which case will change which type of faucet you select. The faucet should stick out around 8 inches to 12 inches from the base. There are certain types and model that will allow that to be 12 inches to 18 inches. 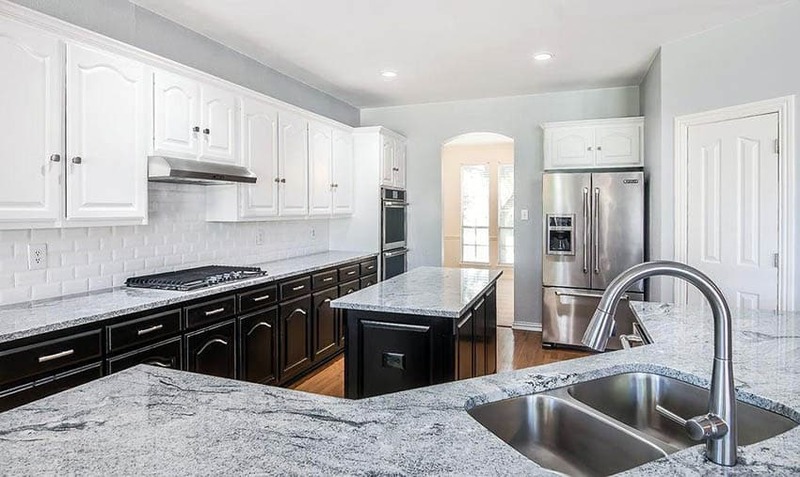 In the cases where you have a cabinet above the sink you will need to take extra steps and measure the height to make sure the faucet will fit under the cabinet. How deep the sink is will be another contributing factor to the size of faucet selected. Shallows sinks are typically more versatile. Deeper sinks will want shorter faucets to maximize precision as well as avoid too much excess splashing. For those who want to see different layouts before purchasing, there is kitchen design software which can help you better visualize a project. When you begin the search to purchase a new faucet it is best to either buy the sink and faucet simultaneously or buy the sink first. 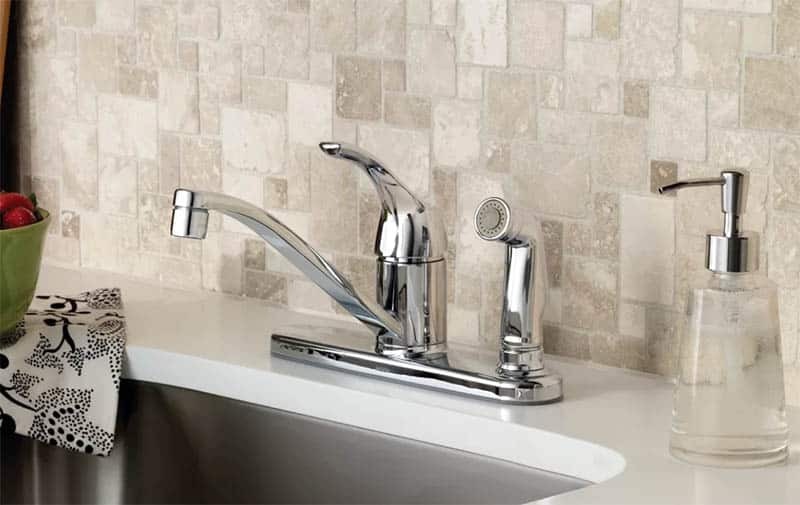 The faucet you choose will need to have the same number of holes as the sink allows, and both the sink and faucet will need to match the countertop, so everything fits together properly. 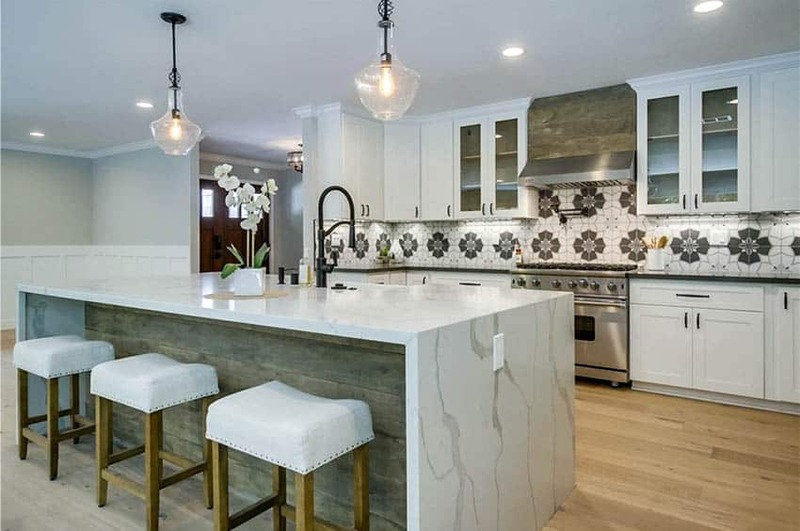 You will want to choose a faucet size that will compliment your sink, as in you will not want a giant, oversized faucet with a small bowl sink, or a tiny faucet for an industrial sized sink. 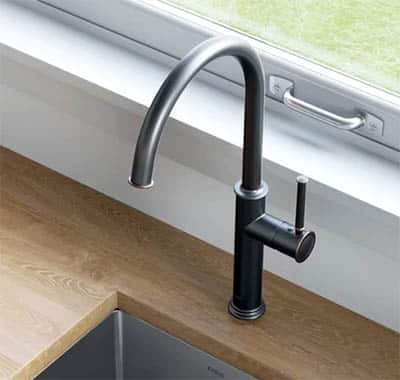 Measure for clearance and spout height will ensure there is sufficient reach, as in the seeing of the spout will be large enough to fill up all sink basins and dispense water in a large portion of the sinks, without getting water outside of the sink. To find this it will be determined by the distance horizontally from the opening of the spout to where it connects to the sink or countertop. Visiting a brick and mortar store will help to give an idea for the style and finishes you like. 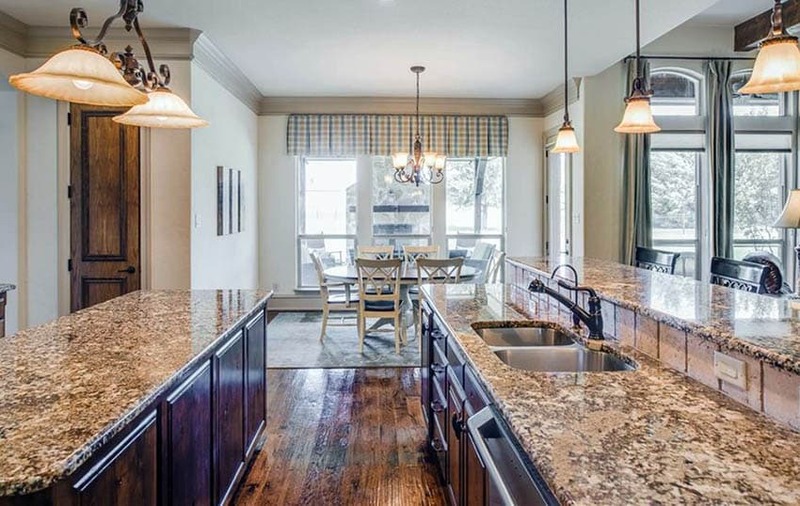 Bringing along any other finishes that may be present in the kitchen will help when picking out a finish. Choosing the sink, faucet and countertops at the same time will allow you to ensure all finishes match together. Test out the different features and types available and consider what works best for you. Testing out the handles to make sure they are as tight or loose as you would want is important because this is something you will be using every single day. 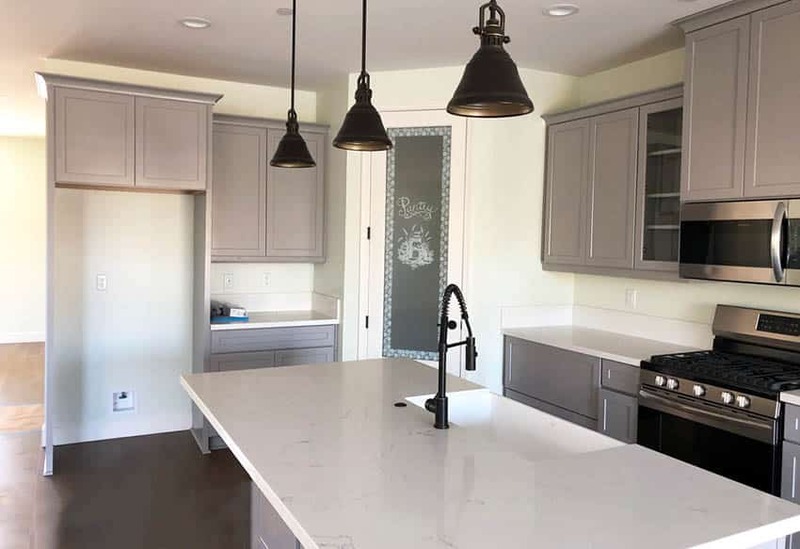 There will be multiple different ways you can install a kitchen sink, depending on whether it will be top mounted, bottom mounted, or wall mounted. Top mounting a faucet will require attaching screws though the bottom of the faucet from under the counter, bottom, just the opposite, attaching screws through the top of the faucet. Installation of a sink is not a very difficult task, and could most definitely be a DIY project, but if you have problems working under the cabinets on your back, hiring an installer may be the way to go. If you need to remove an existing faucet avoid using propane torches to remove rusty nuts. Also avoid using the plumber’s putty because it can stain stone countertops, it is better to use and o-ring that does not require sealant. To install a faucet yourself will take a few steps. Before you do anything make sure the water valves under the sink are off! Turning on the faucet will relieve the pressure. If you have a disposal, turn the power off of that as well. If this is a replacement first you will need to remove the old faucet to make room for the new on. A handy trick will be to take a picture of the current configuration to use as a reference when you are putting it back together. Keeping a bucket underneath will help catch any access water while you are disconnection the old faucet. To remover the faucet you will need to remove the nuts that are holding the faucet in place. Then remove and clean the sinks surface and surrounding areas. Next you will need to assemble the new faucet, following the instructions from the product itself (every faucet will be different just because you have done it before does not mean you are exempt from the instruction manual). After assembling, place the faucet where the old one was or in the new holes, and secure all pieces. Place the gasket, the trim ring, over the holes of the sink and set the deck plate. If the manufactured requires caulk or plumbers’ putty, use this now. Feel the faucet lines into the holes. Then install washers and nuts as necessary. After everything is set into place reconnect the water supply. Check for leaks. Remove the aerator from the faucet and let the water fun slowly to remove and bubbles and to clear the lines. Recheck for leaks. After all has been readjusted then turn the water off and voila, new faucet installed. Some other things to make sure you take care of during this project are also pretty simple. Make sure to clean all debris from a replacement, and mange all the supply lines. Whether you need to reroute existing lines or use the ones where they currently are.